In our teen area, we focus on providing some necessary skills to help your teen develop into a young adult. We help participants gain skills such as social interaction, independence, responsibility and accountability in a fun and easy manner. For more information or questions, contact Mel Lofgren at 847-966-5522 Ext 3023, mlofgren@mnasr.org or see the current brochure. Aquatics You are never too young to learn to swim. No matter the skill level of your child, our staff will work with him or her to develop abilities on an individual basis. Skills include water entry, floating, going underwater and stroke development. Our enthusiastic staff will be sure to get your child involved and excited about swimming. This essential skill will be a lifelong asset. Saturday Teen Lineup (Teen Bowl/Teen Scene) What better way to spend your Saturday then with your friends. Each season, M-NASR offers an action-packed Saturday lineup including bowling, teen centers and field trips into the community. Choose one or both programs to continue the fun. Transportation between programs is provided. Schools Day Out Programs School may be out but M-NASR is in! Whether at an all-day (9:00 a.m. - 3:00 p.m.) special event or at spring and winter break camps, your child will enjoy his or her time away from school in a fun, structured environment. Our staff will work with your child to stay safe and active in an engaging atmosphere. Social Clubs M-NASR offers social clubs each season for our participants. Social Clubs such as Young Adult Club offer our participants a great opportunity to transition slowly from Teen to Adult programs. For more information about Social Clubs, please contact us at 847-966-5522 or follow the link to our Social Club page. P.M. Pals Our afterschool program is held at the Molloy Education Center and focuses on socialization and reaching individual goals. Each day offers new activities that work on positive interactions and forming friendships. Smiles and giggles are common in this program, in addition to Progress Making! For more information about P.M. Pals, please contact us at 847-966-5522. Quest for Success This program is specially designed to help older teens and young adults reach their goals. There are two weekly sessions that allow participants to learn and practice new skills to develop independence. Participants will participate in games, discussions, and experiential activities which focus on their abilities. Past topics have included safety, money management, using technology in recreation, and healthy living. You’ll have even more fun participating in your favorite leisure pursuits when you have a Quest for Success! For more information about Quest for Success, please contact us at 847-966-5522. Special Events Each season we will offer a variety of special events out in the community. These one-day events may include holiday activities, trips to the city, sporting events, theater/concerts, water parks and much more! Overnights Looking for a way to allow your teen to grow independently? M-NASR offers several overnight trips each year. 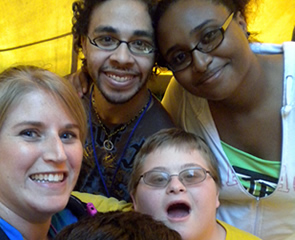 These trips focus on self-help skills, independence, and socialization. Past overnight trips have included camping, going to the Wisconsin Dells and Great America. Trips typically last two to three days and are a highlight of the season. Friendships and memories made will last for years to come! Camp Please see our Summer Day Camp program section.